Shakespeare’s Globe is a venue generally known as a traditional space with little idea of how to engage young audiences. Now, it’s been shaken. The roar of hundreds of women fill this historical reconstruction. I cry and I scream as an all-female ensemble dance with joy, slaying their routine, at the end of Morgan Lloyd Malcolm’s revolution, Emilia. a secondary character who no longer takes centre stage in this Wooden O.
Nicole Charles directs her all-female cast of 13 to rightly reclaim the space they deserve. 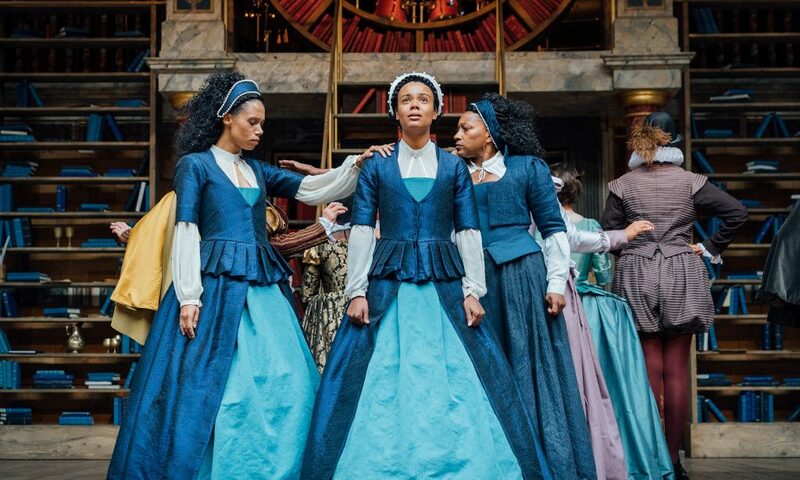 Leah Harvey, Vinette Robinson and Clare Perkins share the titular role of Emilia, but for Malcolm, this is not just a narrative device. Every single choice in this production is led by the principle of intersectionality. The ages of different actresses are to be noticed, for Emila grows throughout her journey. Her womanhood is here to be seen. The colour of her skin is to be noticed, her scars are to be worn proudly. You can tell quickly that the production was made by women. What a relief to watch a three-hour show without an ounce of male gaze present. What a relief to see women telling a story about a woman for other women. “We are as powerful as the stories we tell”, says Emilia. This is the issue with the canon of work we as a society are used to seeing – it’s male-driven. Both writer and director are aware of the constant rejection and erasure so omnipresent in women’s lives. Despite Emilia’s story taking place centuries ago, her story is our story. It is the story of women who keep going because we have no other choice. Emilia Bassano knew she had to keep going. Faced with constant adversity and the reality of living in a patriarchal society, she wrote and she spoke and she never kept quiet. are themes that Malcolm and Charles explore with nuance and complete boldness. The wit and humour of the writing will have you in stitches, whilst the cast of brave and proud women will make you realise just how much you yearn to witness more artistic freedom and agency being given to women. Nadia Albina, Anna Andresen, Shiloh Coke, Leah Harvey, Jenni Maitland, Clare Perkins, Carolyn Pickles, Vinette Robinson, Sophie Russell, Sarah Seggari, Sophie Stone, Charity Wakefield and Amanda Wilkin all deserve the long-lasting, standing ovation for their performances. is a milestone for women in the arts. This production is not polite, middle-class, inaccessible waffle dressed as feminism. When Malcolm draws a parallel between the political climate in Emilia’s times and modern-day Britain, she isn’t just winking at the audiences in the usual gimmicky Globe style. This is political and there is no escaping that. Perhaps this is why some people might not like it, but newsflash: THEATRE IS A POLITICAL SPACE. Women owning their anger in public spaces is rarely shown. We have a right to be seen, represented and we have a right to express ourselves. Theatre is art and people are allowed to have different opinions, but if you are one of those people who did not connect with Emilia, ask yourself why. Ask yourself – why did this story of so many women not speak to you? Perhaps it did not resonate because you were never asked, “Where are you really from?” Maybe you never had to walk into a room and be the only woman of colour. Maybe you were never told you were ‘very angry’ just because you are a black woman an opinion. Maybe you were never a victim of domestic abuse. Maybe a man never referred to your work as a hobby. And if none of that resonates with you, that’s absolutely fine. But see the women around you with fire in their guts and be there for them and listen, because we are not going anywhere. We are not a fad, a box that you can tick, a diversity exercise for your programming. And we are not a risk. We are here. We are staying. Emilia runs through 1 September.